Besides the freshly added 2017 Mercedes-Benz C-Class Estate to the C-Class lineup, the model coming with new styling elements, increased space inside and a wide range of six-cylinder engines under the hood, the German based carmaker has also released the first official videos with the 2017 AMG E63 S Estate, first announced a couple of days ago. We all know that every Mercedes-Benz that receives the AMG`s “gentle touch” stands-out from the crowd with a more aggressive body styling and increased performance, and for a genuine wagon, the new 2017 AMG E63 S is more than just an ordinary family car. Is that family estate that takes you and your kids everywhere you want, with enough space inside to fit an elephant and plenty of horsepower under the hood to try out the most difficult country and muddy roads. And now you have the chance of seeing it showing off in the first videos. Speaking about power, the Mercedes-AMG E63 S Estate comes with a 4.0-liter V8 twin-turbocharged engine, with direct injection, developing an impressive 612 horsepower and 850 Nm of torque. Thanks to that it sprints from 0 to 100 in a whopping 3.5 seconds, at a top speed of just 155 mpg. The large tires, low suspension system and other up-to-date mechanics help the car to achieve such an amazing performance. 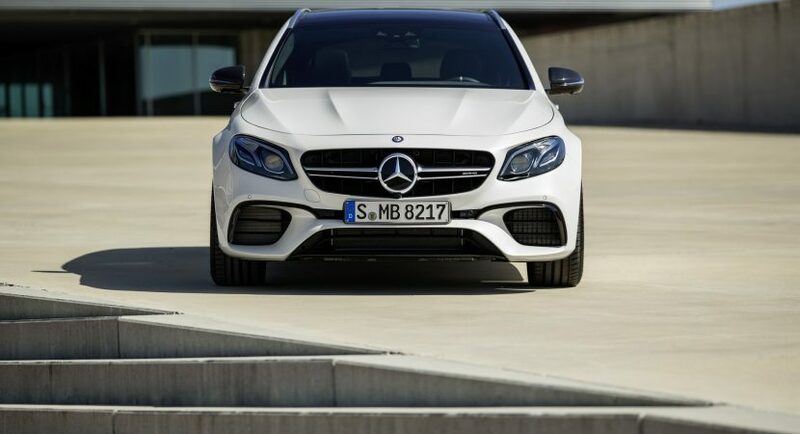 But a powerful wagon also comes with a spicy price, and in German alone, the model might be come with more than the sedan`s starting price of 121,618 euro. On the other hand, its direct rival, the all-new Audi RS6 Avant Performance is set at 117,000 euro.